View of a waterfall at Lydford, at the edge of Dartmoor in Devon. The waterfall is well known in Devon and is part of a mile and a half gorge with striking and beautiful scenery. The gorge is the steepest in south west England and is surrounded by thick woodland. The waterfall is called the White Lady Waterfall and is 30 meters high. During the 19th Century Lydford Gorge became a popular tourist attraction for those who could not travel to Europe. 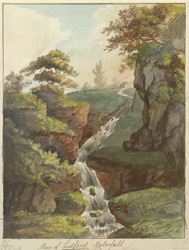 T. H. Williams commented in his guidebook of Devon and Cornwall of 1804, that 'curiosity is first attracted by the noise of water; and a sudden exclamation of surprise generally follows, on looking over the wall; the thick woods on each side exclude the light, but the whiteness of the agitated water is seen at the depth of seventy or eighty feet; the foundation of the piers is perceived, and confidence of security diminishes, as the eye explores the terrifying scene'.